Two-hundred and fifty United Way volunteers came together today to celebrate their part in the organization’s record-breaking fundraising campaign. The 2013 United Way campaign for Guelph, Wellington and Dufferin came in over its goal, with a $3.416 million total announced in mid-December. At the event, Cargill Canada took home the award for Campaign of the Year. Employees at Cargill facilities across the city raised $455,561, an all-time record for their campaign. Forty-eight percent of Cargill’s employees gave to the campaign this year, with seventy-one employees giving over $1000. The Cargill Canada team and Tina Swindells of the University of Guelph received awards for leading outstanding workplace campaigns. 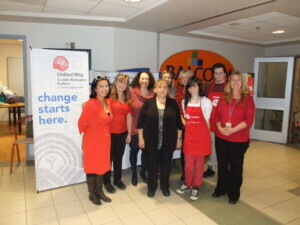 Agricorp, LCBO, Sleeman Breweries Ltd., Roctel Manufacturing, Guelph Hydro, Millennium 1 Solutions and the Guelph General Hospital were among those recognized with United Way spirit awards. Ending his term as Campaign Chair, Jim Jarrell announced Chief Bryan Larkin of the Guelph Police Service would be taking the helm as United Way’s new Campaign Chair for 2014 & 2015. “Thanks to the generosity of our community, United Way is funding fifty-seven agencies and eighty-six programs in the Guelph, Wellington & Dufferin area in 2014”, said Ken Dardano, executive director of United Way Guelph Wellington Dufferin. “The increase in funds raised this year will allow us to better meet the emerging needs of the community”.